Earlier this month, Forbes.com published a simple and clearly written article describing what global warming is and how it works. 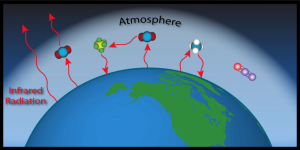 I am not sure I would characterize it as the simplest ever, but it is still a good explanation of how carbon dioxide and other gases are affecting the temperature of the earth as a whole. You can read it here. Next: Where was your location millions of years ago?